The first single from Savoy's album "Mountains Of Time" was released as a radio promo in Norway on 7th July. Following the release of the album, this single shot to No. 2 in the Norwegian radio charts. Around 6th September, limited numbers of this single could be found in a shop in Oslo (NB: The single was also available in Sweden from 1st November 1999). However, research showed that this single wasn't widely available in the shops. This single features three different mixes of Star "I'm not stupid baby": "Radio Edit" (4:22), "Loop-mix" (5:20) and "NYC Mix" (5:19). The tracks were mixed by Ulf W.O.Holand except for track three which was mixed by Jason Corsaro. The cover of the single is of similar design to the album cover for "Mountains Of Time", but there are fifteen photos on the front rather than twelve. Again the pictures are arranged in columns of three, with an extra plain grey box printed above the first column. There are six shots of Lauren and Frode but only three of Paul. The colours featured are different shades of grey, purple and green. The title "Star" is printed in large grey letters towards the top of the sleeve with "I'm not stupid baby" in black small letters above. The black "Savoy" logo is printed in the top right hand corner of the sleeve and the characters "235N" are in the top left hand corner. The inside of the sleeve is light grey. Printed in green across the middle are outlines of boxes which contain details of the tracks. The actual disc is a light metallic green colour. On the left hand side of the disc there are outlines of boxes printed in dark green. Inside the boxes there is information such as title of the single, copyright details and record label logo. The Savoy logo is printed in black at the top on the right hand side. The promo edition of the single is the same as the regular release but has been stamped with a promo ink stamp. There was also a one track promo CD single which featured only the "Radio Edit" of "Star".The cover of this release is similar to the 3 track release and even lists all 3 tracks! Some copies of the promo release come with an EMI promo sticker which gives some information on the band (in Norwegian). 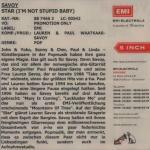 Savoy and the title are printed at the top of the sticker with the EMI logo and release date 12.07.1999 at the bottom. "Star" was released to German radio stations at the end of October 2000. The CD is packaged in a very similar way to the Norwegian release, but has a different track listing. It features the album version of "Bottomless Pit" and "The Bovarnick Twins" (same version as that found on the bonus disc of the limited album) in addition to a radio edit of "Star" (3:59) which differs slightly to the album version. "Star" was remixed by Håkan Wollgaard. On the disc itself, only the title track is mentioned. The promo copy mentions all tracks on the sleeve, but when played only features the radio edit of "Star". Some copies of the promo single come with an EMI insert which gives details of the single, together with some information about the band (in German). The catalogue number given on the promo sheet is the same as the Norwegian release, so this was probably used for promotional purposes in Germany. Sweden: The Swedish promo of "Star" is the same as the Norwegian promo, but includes a promo sticker on the back of the case. The sticker includes information in Swedish and a contact telephone number. It also gives a release date of 1st November. Norway promo Star (Radio Edit) EMI 7243 887466 2 5?